The US Navy has recovered and identified the remains of a sailor who went missing after the USS John S. McCain collided with a merchant vessel, the US Navy's Seventh Fleet said Friday. US Navy and Marine Corps divers recovered and identified remains of 26-year-old Dustin Louis, an electronics technician and sailor, according to the statement. The news comes after the Navy denied claims that human remains that had been found in the sea by Malaysian forces were those of American sailors from the US destroyer. USS John S. McCain collided with the Alnic MC oil tanker near the Malacca strait in Singapore's waters on Monday. The crash left five sailors injured and ten missing. On Thursday, the first body, of a 22-year-old sailor, was recovered. The incident has also stirred up controversy over the condition of US naval forces and triggered dismissal of Navy Seventh Fleet Commander Vice Adm. Joseph Aucoindue due to the loss of confidence. 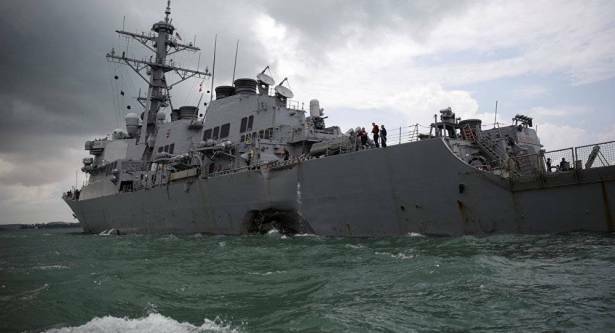 The USS John S. McCain is the second Seventh Fleet ship to collide with another vessel this summer and the fourth since January. In June, seven sailors were killed in a separate incident when the US destroyer Fitzgerald hit a cargo ship off the coast of Japan. Both vessels belonged the Seventh Fleet.